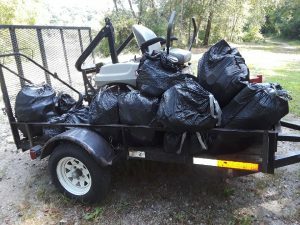 The results for the 2019 Friends of the Lower Appomattox River (FOLAR) Annual Spring River Clean-up are in! This year’s event was another great success due to the many volunteers that helped collect a ton of trash – literally! On Saturday, March 30th, 155 volunteers of all ages and from diverse groups including businesses, civic and youth organizations, Fort Lee, as well as local leaders came out to several locations to help FOLAR board members pick up litter and remove illegally dumped trash and other damaging debris from the river. 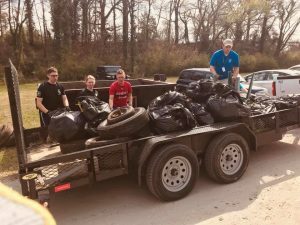 By noon, the volunteers had collected an impressive 200 bags of trash – with cigarette butts, cans and bottles, and plastic bags among the most common items found. Other illegally dumped items removed were 25 tires, 50 pounds of old metal, four sheets of 4’x 8’ paneling, and one bed mattress set! 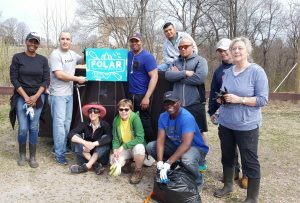 The Spring Clean-up is FOLAR’s signature clean-up event and the largest of several shoreline improvement activities that FOLAR and its partners plan and implement each year in the community. In addition to individual community members at Hopewell City Park, two City Council members, Johnny Partin and Patience Bennett, as well as a representative from Delegate Aird’s office, Brianna Menchion, joined with volunteers from Perdue Farms, American Water Company, John Tyler Community College, and Essentra to collect the most trash of the day. At Rosalyn Landing Park volunteers from C.H.A.R.T.S. 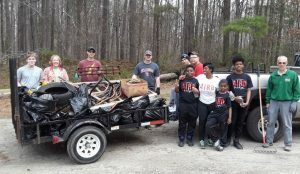 (Colonial Heights Appomattox River Trail System), Kiwanis Club, and Fort Lee joined with individual and families to tackle the near-by ponds. Fort Lee soldiers were also out in force with other volunteers at the Petersburg Patton Park and the Appomattox Riverside Park-Ferndale in Dinwiddie and proved a great help with larger items. If you believe in this work, you know and love the Appomattox River, like we do at FOLAR. You know how great the need is and how important the work is to protect and restore our river’s shoreline.